Tips to delete Configuration File on ipad or iPhone – AppleRepo.com, You can remove a configuration profile from an iPad or iPhone either by using iPhone configuration Utility or directly from the device. Usually it’s easiest to work on the device unless you’ve prevented the user from removing the profile. 1. On the iPad or iPhone, choose Settings > General > Profile to display the Profiles screen (if the device has two or more profiles installed) or the Profile screen (if it has only one profile installed). 2. If the device has multiple profiles installed, touch the profile you want to remove. The device displays the Profile screen. 3. Touch the Remove button on the profile. The device displays the Remove Profile dialog box. If the Remove button doesn’t appear on the Profile screen the administrator has set up the profile as one that can never be removed. The only way to remove it is by using iPhone Configuration Utility. Also, if the profile requires authorization to remove it, the device displays the Remove Protected Profile dialog box and the keyboard. Type the password for removing the profile, and then touch the Remove button. 4. Touch the Remove button to remove the profile. 5. The iPad or iPhone displays the Removing Profile screen while it removes the profile. 1.Launch iPhone Configuration Utility if it’s not already running. 2. Connect the iPad or iPhone to the PC or Mac with a USB cable. 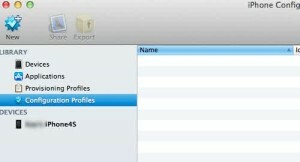 The computer detects the device and adds it to the Devices list in iPhone Configuration Utility. 3. Click the device in the Devices list to display its configuration screens. 4. Click the Configuration Profiles tab to display the Configuration Profiles pane. 5. Click the Remove button for the profile you want to remove. iPhone Configuration Utility displays the Configuration Profile Removal dialog box. 6. Click the Remove button. If you get the error message “Profile Removal Failed: The profile could not be removed from the device” when removing a configuration profile, the problem is most likelty that you’re trying to remove the profile with a different computer than you used to apply it. You can remove a profile only by using iPhone Configuration Utility on the same computer you used to install the profile. This is to prevent users installing iPhone Configuration Profile and uninstalling those carefully crafted profiles you’ve installed. READ How to Convert iTunes Flac to MP3 or Playing FLAC in iTunes? How to Download and Install Themes on iPod Touch?